ST-JÉRÔME, QC – beernews.org reports that Microbrasserie Dieu du Ciel! 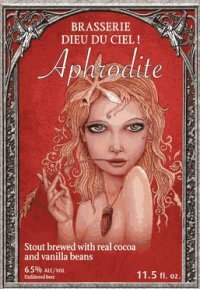 has been given label approval in the US for Aphrodite. A strong stout (6.5%) brewed with cocoa and vanilla, Aphrodite is an alias of Aphrodisiaque, a beer that has been available on an occasional basis over the last six years at the original DDC! brewpub in Montreal. Aphrodisiaque is currently ranked #50 in the best beers in the world according to RateBeer. According to DDC! president Stéphane Ostiguy, the bottled version goes into production in April, with Quebec being the initial market. US label approval was sought by the brewery’s American importer, Shelton Brothers, in hope that there will be sufficient quantities to be shipped south of the border later this year. Maybe this question’s been answered before but how come Dieu du Ciel! hasn’t been picked up by the LCBO? Good question, Japhet. Probably for the same mysterious reason(s) that almost every other Canadian craft brewery outside of Ontario isn’t available at the LCBO. I was kind of figuring that it was the same reasoning that put a stop to bringing Delirium Tremens into the LCBO. Thanks, the .ico is Billy but he GIFs into Pink and then back again.